Then maybe implemented the way that IF the data available from such instruments, it gets applied, otherwise it is applied from a config file? Exporting to openoffice/csv would be grand. By the way, items 4 and 5 on the list above are "unfunded", meaning that we don't yet have committed developer resources for them. Multiple NMEA (and other) sources and their routing are on my list - actually started some experimenting with wxCTB already - hopefully it could solve the notorious Windows serial driver and port detection issues as well. With a release due in September it jumped to the very top of the list. Thank you for the new features in Version 3.0. I recently used OpenCPN to chart moorings, swing radius, channel markers and required channel offsets and found that Coastal Explorer had some very nice features that would have made this easier. From Coastal Exp - Undo button, Add Route button, Add Mark button, Add boundary circle button, Add boundary button, Add range bearing lines button. For each of the above Objects there are certain properties. To some this may seem like overkill, but some features like this would be useful. Alarms can be set for inside and outside a boundary circle or area. 1) Cagney's AIS SART suggestions. I think we're going to see a rapid proliferation of personal AIS beacons, so having good support for them in OpenCPN is going to be important. 2) A "Send All To GPS" button in the route manager that uploads all current routes and waypoints to the GPS. Alternately, the ability to select multiple routes and waypoints before clicking "Send To GPS". Us Furuno users are hamstrung by Furuno's insistence in deleting everything in the plotter before starting a new upload, so currently if you sync with OpenCPN you can never have more than 1 route - with just the waypoints in it - loaded. .... so currently if you sync with OpenCPN you can never have more than 1 route - with just the waypoints in it - loaded. I overcome this limitation of my Furuno GP-32 by using the GPS Utility program to combine multiple routes into one file for upload. In preparation for some upcoming passages I have recently loaded 9 routes with 120 waypoints into the Furuno GPS. Another limitation I've found is that only the waypoints get uploaded. But creating the routes in the GPS isn't difficult, just takes a bit of time. This does, however, give you a chance to review the route as you create them using the uploaded waypoints. Since you never have to type or 'press in' waypoint locations it eliminates errors in that respect (though the original waypoint may be in error). I have also combined routes into one file for display but have not tried uploading them using OpenCPN. Has anyone? Another limitation I've found is that only the waypoints get uploaded. render OWN SHIP according to their heading, when available, and to course otherwise. Dave, I guess your radar plugin should be in that list, no? Yes! the last posts re the Garmin Radar display sounded like it would be ready soon. I have just bought a Garmin Radar HD dome and was hoping to display it on O. 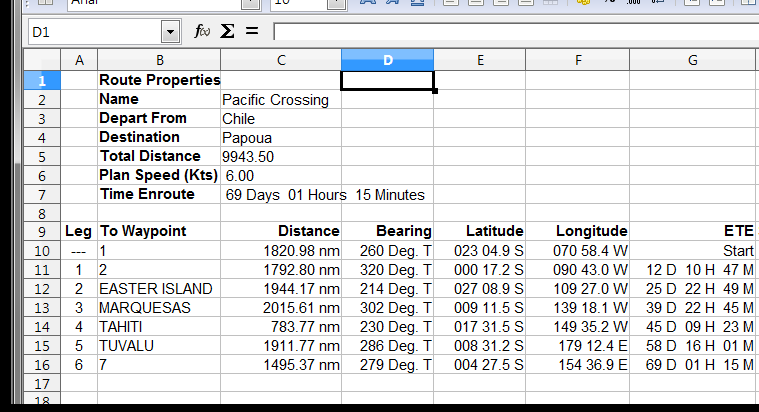 It would be very helpful to be able to edit the waypoints in the Route Properties box (as I can in Sea Clear) and to see the lat/lon in the Route Properties box to more than 0.1 minutes - hopefully 0.001 minutes. OpenCPN Garmin radar overlay PlugIn will be available for Beta test soon, and is independent from O 3.2 mainline development. Ok, we'll have a Stella or two. Maybe I'll have the boat there. One thing I'd really like to see done is a complete re-working of how the chart quilting and displaying is handled. I had tried many ways of solving this issue. It is the same in my Arch Linux OS as well as my install of Windows 7 on the same machine (same hard drive.) I have deleted the .opencpn directory in my /home/"username" directory, built the thing from source via git, as well as a plain ol' cmake build process from the source file. I just can't get my RNC charts to display properly. The viewability of the overall chart quilt does not work, and only certain RNC's will display. I've tried only having RNC's as the charts that are available, with no ENC's in the new database, at all. ENC's display just fine, incidentally. I thought it might be OpenGL, but since windows doesn't use it unless enabled within the application--OpenCPN-- (I've tried this, as well on the Linux side, and it's the same in both OS's. To me, this smacks of it either being my personal laptop, or bad code interpretation of the chart quilting, bad image compression-to-display issues, etc. I wish I knew more about coding so I could offer a more pragmatic solution, but my knowledge base and skills are not there yet. So, that's it. I would like to see seamless quilting between RNC (Mercator and Polyconic 'play-nice-together' functionality), and a better selection interface for charts, like a mousewheel scrolling size/zoom (selectable) feature. Otherwise, nice software. At least the ENC's work correctly. Lets take a look at your logfiles. The location you are referencing (Duncan Bay) works fine for me, and others who have tried it. I'd like to solve your problem, but we need more info. All times are GMT -7. The time now is 03:15.